Join us for a fascinating tour of this unique 18th century mill village sitting alongside the picturesque River Clyde. Now one of Scotland’s six UNESCO World Heritage Sites, New Lanark was founded in 1786 by David Dale, who built cotton mills and housing for the mill workers. 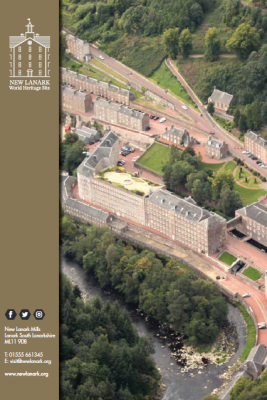 In partnership with Robert Owen, a Welsh philanthropist and social reformer, New Lanark became a successful business and an early example of a planned settlement and so an important milestone in the historical development of urban planning. Workers enjoyed fair wages, free health care, a new education system and the first workplace nursery school in the world! In addition, Fellows of the Society will also be treated to a morning visit to Biggar and Upper Clydesdale Museum. This museum explores 14,000 years of rural and small town life in Upper Clydesdale. It focuses on the people who lived and worked in the area from prehistoric times up to the mid-20th century and illuminates a small part of their ordinary and extraordinary lives. Tickets cost £40 for Fellows and £45 for guests. This includes return coach, all talks and tours and lunch. Booking form can be found here or book online below.